There is a concept I learnt from Finance: Sunk Cost. Sunk Costs are investment of time, energy and money that can’t be recovered once they’ve been made. No matter what you will do, you will not recover the sunk costs. Even if this seems easy to understand, we often make our future decisions victims of the sunk cost fallacy. We continue to invest more time, energy and money in something that is not worth it, just because we already spent so much and these sunk costs affect our choices. Instead all that matters is how much more investment is required versus the reward you expect to obtain. Time ago I’ve I booked a flight to London. It was one month before the departure. Some days before I didn’t feel very well so I decided to do not go. I might have taken the flight , but I thought that If I had gone to London, the additional investment in time, energy and money would have been much higher that the expected reward in enjoying the city. The reaction of my friends was: “Are you mad? You have already spent the money for the flight!”… They were under the sunk cost fallacy. I knew that in my situation I wouldn’t have had a good time in London and I didn’t let the sunk costs affect my choice. Unfortunately our life is full of examples of the sunk cost fallacy, we should recognize it and don’t let the sunk costs affect our choices. Please don’t call it “Agile”! Really! I can’t stand anymore listening to the word “Agile” and seeing the main principles neither understood nor respected. I can’t stand anymore seeing agile transformations where the only goal is the transformation itself as a new process to put in place. I can’t stand anymore arguing with people who think to have understood “Agile” because they use some sticky notes and do some daily meetings. For many people who do agile or want to do agile, the agile manifesto is often a piece of paper without real meaning. I don’t have the agile manifesto attached in my room and the point here it’s not to be a “purist” of all agile principles. I don’t care. I do care about people: respecting people, giving people autonomy, motivating people, trusting people, collaborating and improving with people. I care about the human side of business: business done by people who wants to satisfy and delight customers, business done by people as it is their own private business. I always considered Agile as an enabler for all of this, as opposite of other ways to developing software where people are like “cogs in the machinery“. Agile is “people oriented”. This is the most important thing to understand. Agile for me is tightly linked to new Management principles and practices (ex: Management 3.0) and to the organisational structure and values. I believe that you cannot have Agile without changing or adapting the others points, unless they are already “people oriented”. I believe in “Guiding Structure“: the structure of your environment is the largest determinant of your behaviour. So if you want to have Agile ensure that all your guiding structures are “people oriented” too (management, organizational structure, values, rewards, etc.). This remembered me the typical discussions I had with our Product Owner when I was working in a Scrum team. “Prioritization” was the answer. The Product Owner was used to discuss with us the requirements, giving priorities to maximize the return on investment. This time I’m not working in a Scrum team, this time the context is different and it’s me playing the Product Owner role. Here’s the situation: I’m looking to buy a new apartment. “You need to choose among your criteria because you cannot have everything for that price” is what the real-estate agent said. Now I start to better understand my old Product Owner… how can I accept to buy an apartment that doesn’t match all my criteria? And which requirements can I eventually leave out? Like a “contrappasso” punishment it’s now me the one who needs to prioritize because most likely I will not find an apartment matching all my criteria. The main question is: which are the most important criteria I need to match? I started creating an excel file to list all my criteria. I grouped them by theme (building, cost, plan, etc.) and I used the MoSCoW technique to have a first prioritization. I soon discovered I committed what I call the first Product Owner sin: everything is a MUST. It’s not easy to tell that something is not a MUST when you think you need everything… So the real question is: what is a real a MUST-have? Which requirements can I leave out? How much one requirement is more important than the other? I started to turn the questions. Instead of asking myself “Do you need a parking?” I asked: “Will I buy the apartment without a parking?” “Will I buy the apartment without a balcony?” I realized it’s easier to give priorities considering how bad it is if a requirement is not matched.. I progressed with MOSCOW prioritization but I wasn’t fully satisfied yet. In software development we can prioritize different features by business value: the financial value of the feature, the cost of developing that feature, the risk removed by developing it, the knowledge created, etc. If I was looking for an apartments with the goal of investing my money I could use financial prioritization, but for me it’s important to find a good apartment where I want to live. I don’t want to consider the financial aspects now (ex: buy vs. rental, the internal rate of return, payback period, etc). I decided to do not use any financial prioritization. By the way I would be interested to know if some Product Owners out there really use it in software development, because I’ve never seen a PO doing it (unfortunately). What I was missing is something to help me understand how the criteria influence my overall satisfaction when buying the apartment. 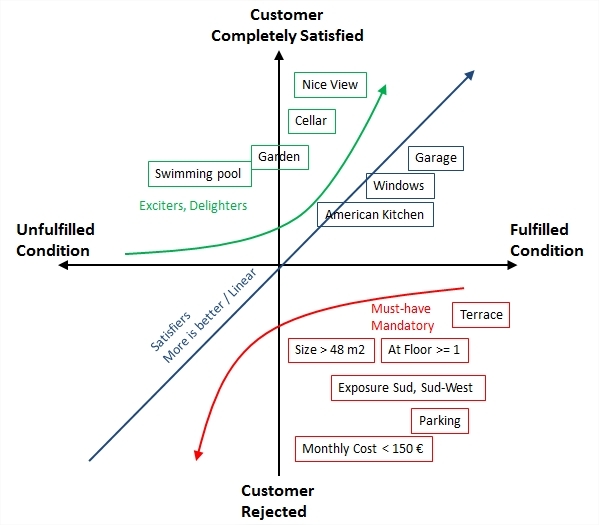 Then I remembered the Kano Model that is based on the fact that customer satisfaction (my satisfaction in this case) is not influenced in the same way by all features. Some of them are in a linear correlation with satisfaction, others are able to provide great satisfaction but are not fundamentals and finally there are features that if missing would make me feel unsatisfied. Must-haves: all the mandatory criteria of my new apartment. Without these I will be not satisfied of my new apartment. The more, the better: all the features for which my satisfaction is correlated linearly. Exciting to have: all the criteria that can provide great satisfaction but for whose absence will not decrease my satisfaction below neutral. The idea is to ask for each requirement a functional (positive) and dysfunctional (negative) question assigning a predefined type of answer. The functional question is to determine how do you feel if the requirement can be met. The dysfunctional question is to determine how do you feel if the requirement can’t be met. The answers together give a category for the importance of the requirement. I added in my excel file a functional and dysfunctional question for each of my requirement and I gave an answer to these questions. Q – Questionable (reflecting unclear results which cannot be graded). At the end of the exercise I visualized my criteria on a Kano chart. Here below a simplified version of it. I found the exercise really useful to visualize what is important and to see how the apartment criteria are related to my satisfaction. I will give it to my real-estate agent hoping it will help to find my new apartment. What do you think ? Did you buy an appartement ? How did you prioritize among your criteria ?